Food is fuel and we consume food to survive. It provides us with the daily energy. However if you would like to achieve a healthy weight, apart from eating right, watching your calories is crucial too. To maintain your weight, it is important to balance your intake with your activity level. 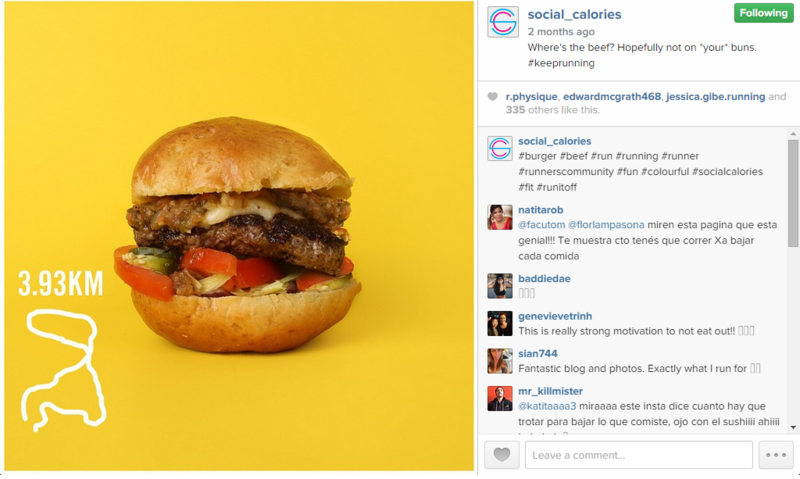 After you have a look at this Instagram account, you may want to think again before you eat that juicy beef burger for lunch. Unless you love to run, because you would need to run 3.93 km to burn off that beef burger. 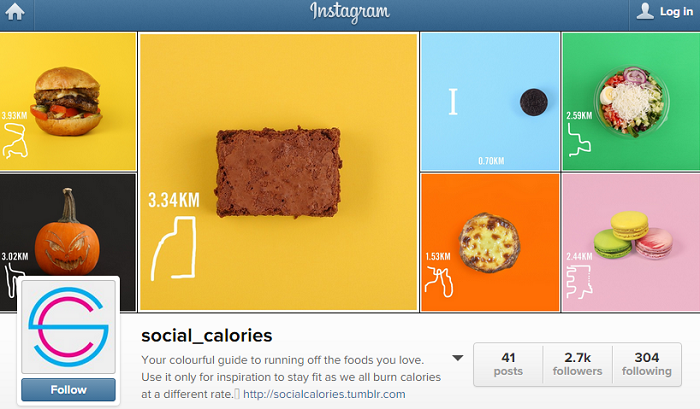 A Canadian-based Instagram account named “Social Calories” is run by a creative team in an advertising agency in Toronto. 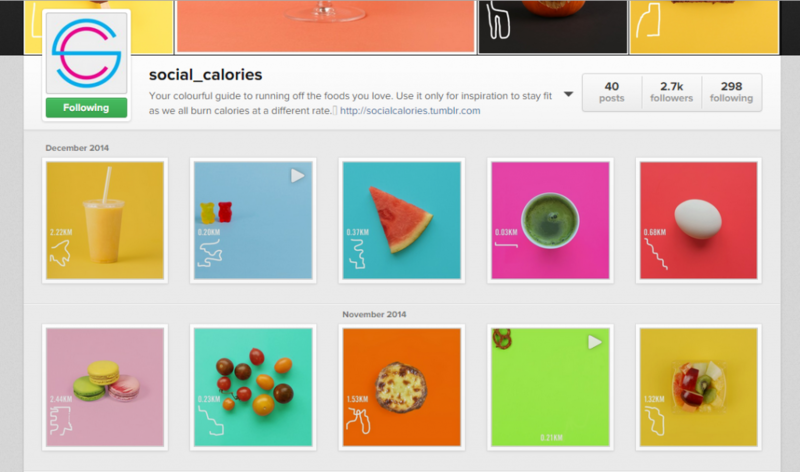 The Instagram account is basically a colourful guideline, posting photos of many types of food to show you the distance that you need to run in order to burn off food that you consume. 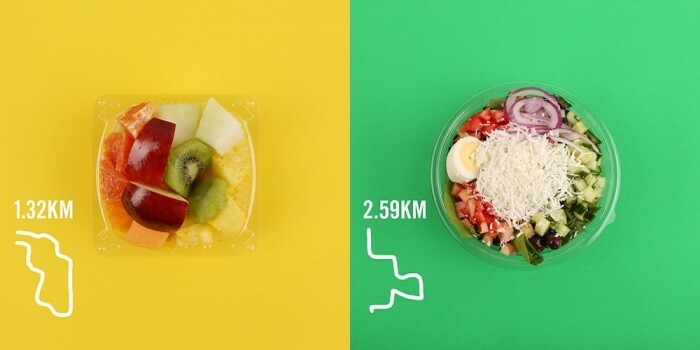 From macaroons and pretzels, to cherry tomatoes and even a Portuguese custard tart, each food item is paired with a number and the route that you need to run to burn off the calories in the food item. The team consists of three people: Nimo the writer, Gus the designer/photographer, and Pepe the art director. Three of them are professionals who have backgrounds in the creative industries. Three of them shoot, write and animate most of the stuff on site. Social Calories is a personal project that they love doing in their spare time without collaborating with any companies. According to Pepe, this Instagram account serves as a response campaign to the ever mushrooming number of running posts that we are see all over social media platforms, such as Twitter and Instagram. “People are pretty well informed about the number of calories in the food they eat, but don’t necessarily know how much they need to run to burn off said calories,” Pepe told Vulcan Post. Having said that, with their passion and love on good food and running, the idea of creating an inspirational guide was sparked instantly. They then decided to create these lovely food posts with an accompanying running fitness guide, to remind people to stay fit and healthy. Every food post is attached with a running distance. However, one may wonder how accurate it is as everyone burn calories at a different rate. According to Pepe, the distance required to run is relative, based on burning off roughly 450 calories in a 5 km run. For instance, some people may burn off 300 calories while others able to burn 600 calories, it all depends on gender, age, weight, and running pace. When asked about their beautiful pictures, Pepe said the set up is simple and does not require much equipment. It is just a couple of lights and a decent Canon camera and shoot on a small table against some colour backdrops. Sometimes they even use an iPhone 6 and natural light. Then some light retouching is done in Adobe Photoshop. 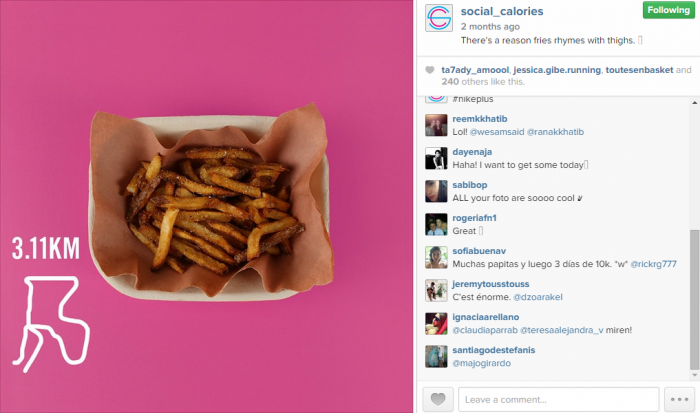 Social Calories was launched in September 2014 and it has been getting a number of positive feedback and comments across Instagram, Twitter and Tumblr. “We are excited about that because one of our main goals is to make our followers smile along the way,” said Pepe. As a food lover and someone who enjoys running, this type of social media account is something I would like to see flourish in the future. In the meantime, I will just use Social Calories as my reference to up my running exercises.